Hey it’s Monday. You know what that means – Magic! This challenge has been out there for eons, and lots of folks have asked me if I’d take it on. And I did, back in December. I shot this video last year! Yep! And why is it only getting posted now? Because it’s been SO hard to get the stamps restocked. I guess lots of people love it as much as I did. There’s only a couple, so if you’re considering this one – snag it while ya can! Watch the video below, or click HERE to see it in HD on YouTube! 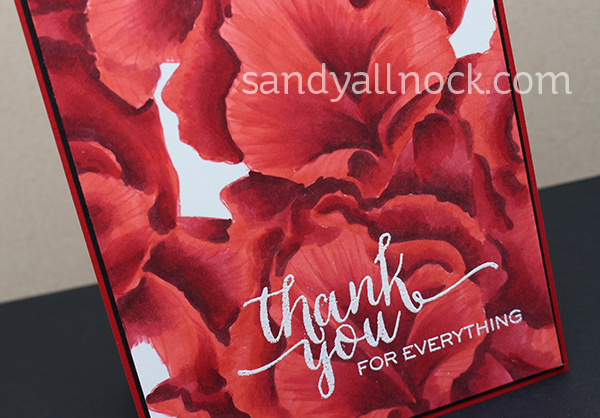 For the card itself, a simple layering and sentiment stamp were more than enough to add. Fortunately I didn’t mess it up with the embossing – usually I flake little bits all over the place, even using a powder tool! ha. I loved watching you color these flowers using only 3 colors. Thanks for showing us how to achieve such amazing results. WOnderful video. It was like watching magic happen! Hi Sandy, I just wanted to let you know I gave this a try and posted it on my blog today, thank you so much for the beautiful inspiration! Your artistic talent and teaching skills are a blessing! Sandy, this card is beautiful! As much as I like it when you do voice-overs, I still love your Magic Monday videos. Watching you make the image come to life IS magic. Today’s video was inspiring. The music you chose went perfectly with the image. I loved it! what an inspiration. I never would have thought to do that with this stamp. You can almost feel the texture of those flowers. Gonna give it a try. There are no words to adequately express how inspired I was by your video. Thank you. Gorgeous card. It would be amazing even if you had used a whole palette of Copic colors, but to have used only three: Phenomenal !!! You are so talented, and so gracious about sharing your knowledge with us. Thank you. Beautiful card! As always your coloring is fantastic. I think this is your most gorgeous card ever! Absolutely stunning! I like that there are only three (3) markers used. I can handle that amount. Sandy, there’s is absolutely no one else who could make a background stamp look like this. You continue to amaze. Wow! Amazing! Awesome! I was mesmerized watching this video. The depth is unbelievable. Love that stamp…. Oh holy cow what an eye catching card. Fabulous. Looking forward to the video. Sandy, This is amazing. How do you “see” where to shade? I look at just the stamped image before you started coloring and was lost as to where you put the shading. I can kind of understand how to shade one flower, but the blooms all overlapping really threw me. Is it something you would consider teaching us in an online class? Thanks for sharing your talents! Oh my goodness…such beauty. Great video as well. Most impressive!! Three colors! Love your card!! Wow! It makes me think I need to try it—especially now that you’ve shown us where the shading goes. I think that might be the hardest part to figure out. Thank you for a great video!! Absolutely amazing, Sandy! One of my faves of yours, for sure! Wow, wow, wow, wow!!! Although I missed your commentary in the video, your work is ALWAYS INCREDIBLE! How you turned that stamp into a masterpiece is truly AWE–INSPIRING. If only I could have a 1/4 of your artistic talent …one could only dream 🙂 Thank you for sharing. Wow! Yes, this is a “wow” card! I love that you did this with only three markers. There is such depth to those flowers. And lucky for me, I have that stamp, and have used it before, but what I made doesn’t even come close to what you created. Thanks for sharing! I am speechless ! Hats off to you. OH MY GOD! That is…speechless! Wowzer! That is so beautiful and your video was mesmerizing! Love it! Absolutely stunning! Your talent never ceases to amaze! I have learned so much since I started following your blog and watching your videos. You are one talented gal!!!! Bless you for sharing this talent so freely. Inspirational! You teach us so much and are such an enabler! Just breathtaking! I love the red (it was my mother’s favorite color), but I can also see this in different colors. Thank you! Way over the top, lady! How you can do something like this with just 3 colors is a tribute to your talent and imagination! I’ve watched you color some amazing things, but this is the first one that I figure I OUGHT to be able to do – and I’ll try – but I know there’s a Grand Canyon’s worth of difference between me and the PRO! Thank you once again, for all you do. Thank you for encouraging us “paper crafters” to realize that we are artists. It was like a light bulb when you said it and I have been blooming ever since. What ever my medium, I am creating and expressing something wonderful.